It’s time to ditch your diet as Easter is upon us meaning chocolate, chocolate, and maybe even the odd Angry Bird Easter egg! Like many others I find the lure of chocolate an unstoppable force, so impossible to avoid with its lustful call that realistically I never even bother to try. So of course even the slight mention of a chocolate Easter egg workshop will have me flipping over chairs and scaring innocent bystanders. Fortunately for me I managed to secure a place at Le Cordon Bleu New Zealand’s chocolate affair, and before I even walked into the kitchen, I gained a puppy like demeanour after spotting the kilos of chocolate soon to be at my disposal. The plan for the day was simple, make beautiful chocolate Easter eggs, Coloured Cocoa butter (for the eggs), Muscadines, Milk chocolate and Hazelnut Tuiles, and then try to eat as much of it as possible without anyone noticing. However once you get past this strong desire to eat everything within arm’s reach, you soon start to appreciate the playful ability that is chocolate. That’s what the workshop is really all about, discovering the many uses, shapes, and all round things that this wonderful treat can do. As you could guess by the name, the main event was making and designing your own Easter eggs. Of course this isn’t your usual hollow display of tin foil and thin cheap chocolate. Instead we were tasked with creating two grand displays, a colourful Faberge egg like piece, and the most ‘Angry bird’ looking rooster you will possibly see in your life. 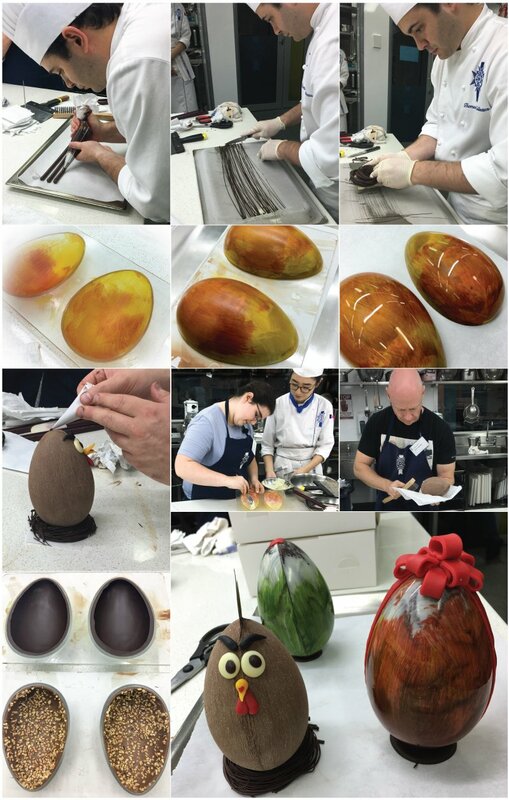 It seemed like an impossible task at first, but as Chef Thomas walked us through the process and his student helpers assisted me each time I got lost, I soon found myself becoming the Catherin Walker of Easter eggs. The most intriguing aspect as mentioned before, was witnessing the different ways in which you can shape and form chocolate. Starting with moulding the chocolate into the egg itself, and ending with using more chocolate as glue; it was a delight to go through the process. Perfectly tempering the chocolate, forming the mould with melted chocolate, trying not to break the thing whilst carefully gluing the chocolate together with more chocolate, and of course making my own French version of Le Angry Bird. The ‘Muscadines’ and ‘Milk chocolate and Hazelnut Tuiles’ provided a great snack to keep me energised throughout the whole class, whilst also teaching me a few handy tricks and recipes for creating quick and easy treats for impressing the odd dinner guest or two. Of course in essence nothing is truly easy about chocolate, it is an ever changing delicacy which deserves our utmost respect. If it’s not set it’s melting, and if you are trying to get it to melt then it’s probably setting despite your desire. The Chefs not only made it look simple, but eventually had me doing the same, which says a lot about the about the passion of the Chefs and even the workshop itself. Indeed I came out covered almost entirely in chocolate, half of it from my epic classroom battles, and the other half from pure consumption. But mostly I came out with a smile. I strode in a complete novice, and somehow managed to learn, laugh can create something I am pretty proud of. I would never say no to a day of chocolate, and after completing the Easter egg workshop I would strongly warn anybody against even trying to stop me in the future.